There is nothing more satisfying than witnessing a home transform from a run down and dilapidated structure into a brand new space that oozes contemporary style and innovative design. This is why at homify, we find before and afters so incredible to experience. Architects and designers are true visionaries, taking a seemingly hopeless space and evolving into something far more than a habitable home. It becomes a true work of art, representing current trends and popular styles. 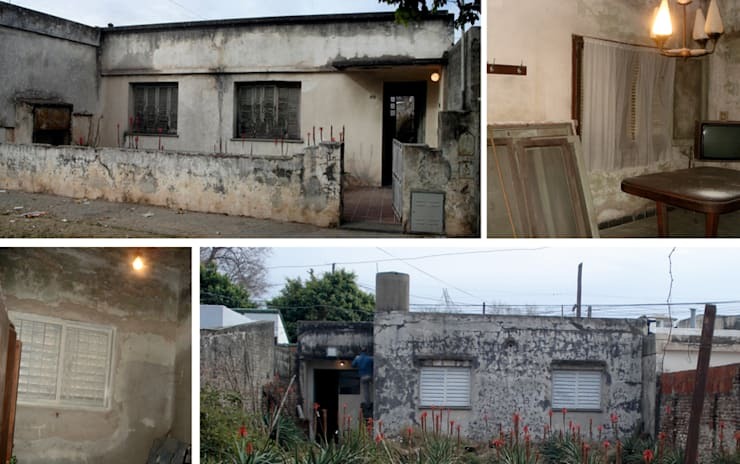 This is exactly what we are going to witness today in Rosario Argentina, where design professionals Elva Architects have completely renovated a very unattractive and decrepit home. The result is simply stunning! There is no way that anyone could have lived in this house in the state that it was in. The walls are completely stained and are full of mould. The perimetre wall looks like it is rotting. The back garden is overgrown and out of control, doing nothing to enhance the appeal of the property. If you had to drive past this home, you would think that it was completely abandoned. The little glimpse of the interiors shows us that the inside is just as bad as the outside. It features some very old-fashioned furniture, a chandelier with only one light working and pink walls that are old and stained. This looks like a scary ghost house from the movies! The designers have completely changed the look and feel of the home, going for a modern design with clean lines as well as installing an element of security. 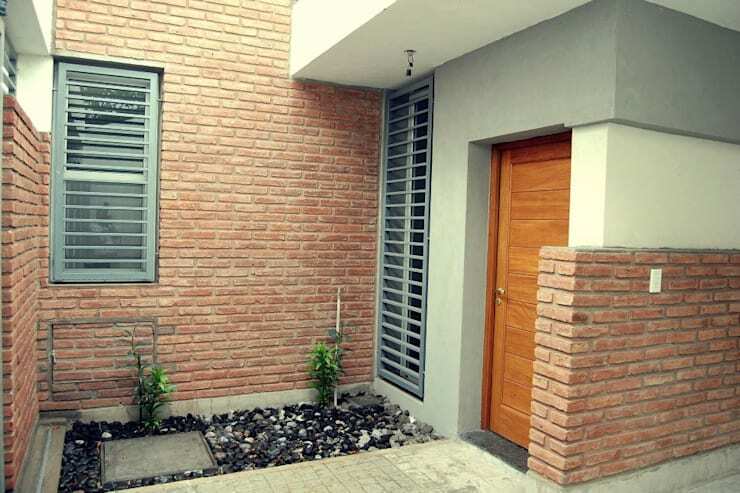 From the outside, we can see how a raw and industrial chic brick wall works in harmony with a blue steel pedestrian gate and gate for the cars. These two tones and textures contrast with one another beautifully, turning heads. 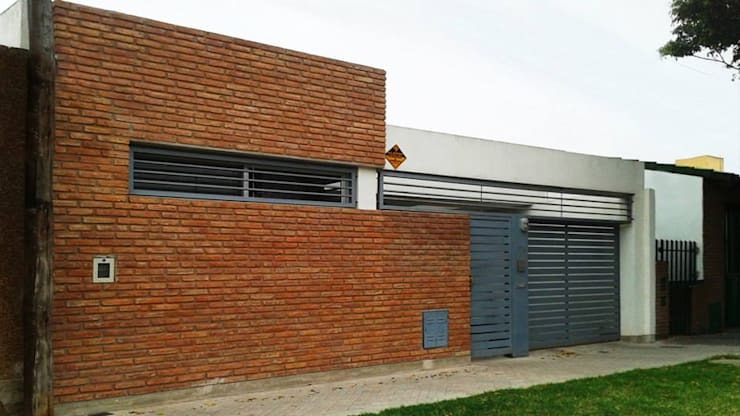 We can see how safe the home is now thanks to the higher wall and the steel gate, yet it doesn't look too overwhelming. As South Africans, we know how important it is to have a safe home, but we don't want it to end up looking like a prison. The designers have achieved the right balance here. 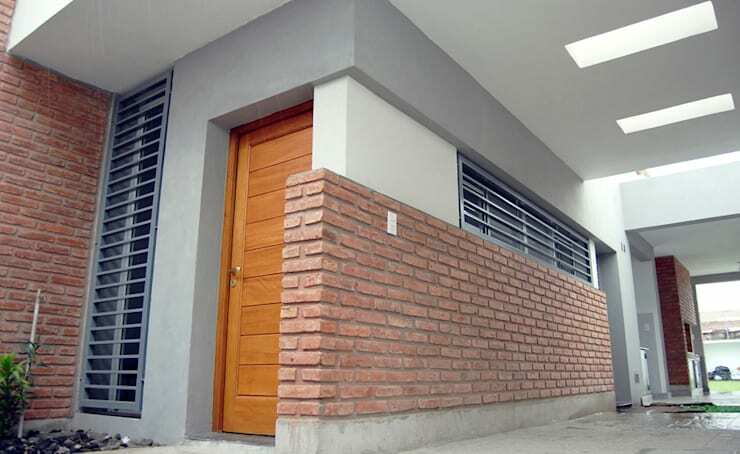 The front door to the home is a simple wooden door, which complements the raw brick and smooth grey plastered walls. Remember that your entrance is the first impression that people will get of your home so you want it to be appealing. A wooden door is always a good idea as this is a very warm material that is homely and inviting. Have a look at: How you can create a beautiful entrance in 6 easy steps. The windows of the home are covered in metal slats, again offering the family privacy and security without compromising on access to natural light. This image looks like chalk and cheese compared to the image that we saw of the garden and the back of the home in the before photographs. 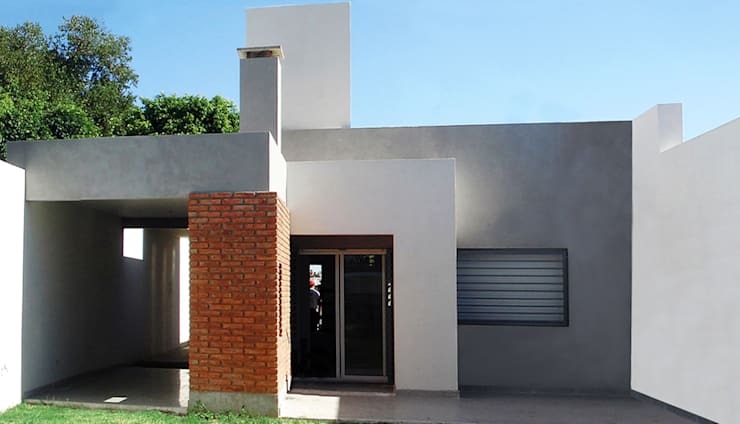 In this image, we really get a sense of the modern and contemporary design, where the home features a flat roof that neatly packages the rest of the structure below it. The designers have played with volumes and shapes, bringing out different parts of the house to create quite a 3D effect. A touch of raw brick enhances the design, adding to the texture. We can also see how a neat garden with a manicured lawn and some well planted flowers and trees can make a huge difference to the look and feel of a home. 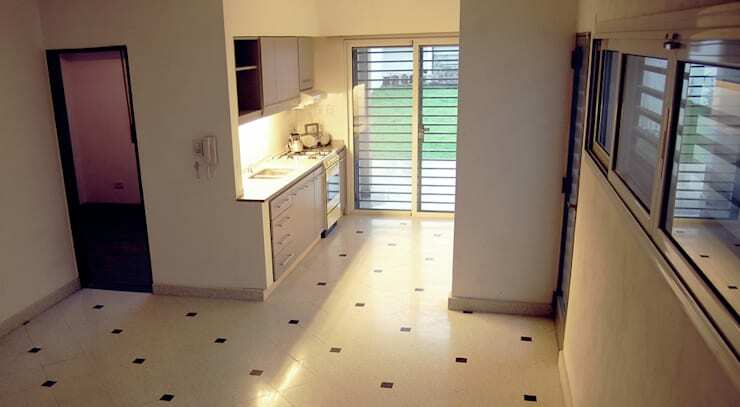 The interior of the home has been completely renovated. The walls are now a crisp and modern white colour, while the floors have been replaced by far more modern alternatives. In the kitchen, we can see how the linoleum patterned floors create a subtly stylish area for cooking, while the grey cabinets and drawers bring a bit of charm and warmth to the space. We can also see how the home is connected to the exterior thanks to large glass sliding doors, which allows natural light to flow through the interior. It also gives the impression of space. 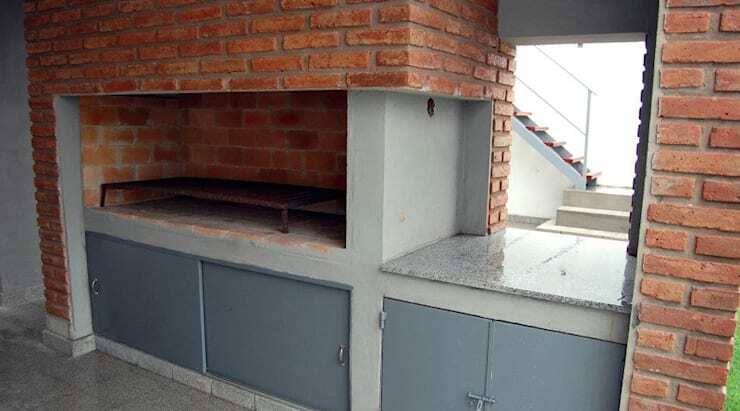 Every home needs a braai area! The designers have installed one in the outside space of this home, giving the family the perfect area for interacting over some deliciously cooked food while enjoying the sunshine and fresh air. We can see that there is plenty of storage space in this area so that all braai equipment and any cutlery and crockery needed for this space can be stored neatly away—a great tip! The granite counters also add a touch of luxury to the area, while providing the perfect surface for chopping and preparing food. As we leave this home, we just want to go past the entrance one more time to show you the stylish little flower bed at the front of the home, which also adds to the appeal of the design. Have a look at how you can make a big impression with a small front garden for inspiration for your own home! This new and improved home is stylish but also incredibly functional, thanks to these design experts. The family now have a safe and modern home that is cosy and comfortable. Are you impressed with this home renovation?